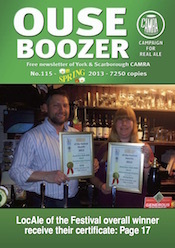 This entry was posted in OB115, Ouse Boozer, Ouse Boozer Magazine on 26th February 2013 by York CAMRA. 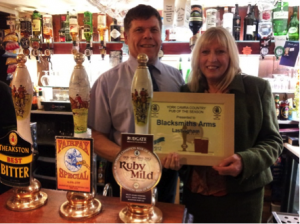 I was at the New Inn, Cliffe for the Winter Pub of the Season presentation – an award the pub had jointly won with the Blacksmiths Arms at Lastingham. The New Inn was proposed for the award for its transformation from a down-at-heel village local into a vibrant, real ale supporting community pub whilst still retaining its local character. Before Ian and Adele took over the running of the pub just over eighteen months ago the former Enterprise Inns house had seen successive short tenure licensees and virtually no investment for many years. The opportunity was taken to carry out a full refurbishment inside, removing the poorly sited stairs to the living accommodation out of the main entrance and opening up the bar and the lounge areas. Complete redecoration, new furniture and lighting has resulted in a step change in the ambience of the pub as you walk through the door. Brighter and more spacious yet still warm and welcoming, the effect is immediate. Of perhaps more importance to CAMRA members and local beer drinkers alike is the growth of hand pumps on the bar – one has become six! Ian has squeezed the last few inches of space in the modest – nay, tiny – cellar to provide some carefully chosen and splendidly presented beers. The beers on offer have a distinctly local theme and why not when we have so many wonderful breweries nearby? A quick scan of tonight’s ‘menu’ revealed the following: Brown Cow Captain Oates, All Hallows Peg Fyfe Dark Mild, Salamander Thin White Duke (which ran out and was replaced by Rudgate Winter’s Ale), Saltaire South Island Pale and Wold Top Wold Gold. This sort of choice is now happily a typical sight in the pub – a far cry from the single John Smith’s Cask offering in the past! John Smith’s Cask is still available for those who prefer it. Ian makes a conscious effort to support our local breweries and the pub signed up for LocAle soon after Ian and Adele settled in. Indeed, at the presentation two of our local breweries were represented – Brown Cow by Sue and Keith Simpson and Bird Brain by Phil Usher. As Ian pointed out, in just seventeen months the pub has just had its 50th brewery represented and 251st different beer on the bar which is some achievement for the pub (and its cellar!). Ian and Adele have links with the Cliffe area and so were mindful of the requirements of locals when they undertook the transformation of the pub. The darts, dominoes and football teams are well catered for and Ian’s first beer festival last September was used to raise some £2,000 for the village playing fields association. This entry was posted in OB115, POTS, Presentations, Pub News and tagged New Inn Cliffe on 26th February 2013 by York CAMRA. On January 12th a full bus (28 members) eagerly set out to the wilderness beyond Pickering! Our destination was the Blacksmiths Arms at Lastingham for the presentation of the joint Winter Pub of the Season 2013. Because many are not used to being so far outside York, we had decided to take a couple of detours. First thirsty stop was the New Inn at Cropton, where we all enjoyed trying to match the newly-named beers of Great Yorkshire Brewery to the old Cropton range. I think everyone did well here and there were still some old favourites such as Scoresby Stout and Monkmans Slaughter on tap. On arrival at the Blacksmiths Arms, we were greeted with the old world charm of a great log fire burning in the Yorkshire range in the bar, a warm welcome from the staff and a room prepared for our delicious buffet. We crowded into the cosy bar to hear Pat Burlingham present the award to owners Peter and Hils Trafford. She described how Pete and Hils have worked hard over nine years to build up trade in difficult times: they not only provide accommodation and a top quality restaurant, but they also maintain a traditional bar and serve quality ales from local breweries. Over their time Pete and Hils have refurbished and made small and sympathetic improvements to the multi-room layout. Peter was obviously delighted with the award and gave a great speech which included pointing out his growing collection of pump clips pinned to the ceiling beams. On offer on our visit were the regular, Theakston’s Bitter, together with Rudgate Ruby Mild and Marston Moor Fairfax Special, which was later replaced by Rudgate Volsung – all were in tiptop condition. Pat had a little story to illustrate the community spirit Pete and Hils foster here. In June 2004 they put on a whole day of nostalgia to commemorate 60 years after the D Day Landings. There was a tank outside, everyone was dressed in 1940’s fashion and, of course, there were spam fritters. As Pat’s dad Bill Burlingham, then 90 years old, was a survivor of this day, Pat and Stuart took him along. Well, as he was the only person who had actually been there he was made a great fuss of (quite rightly) and had a fantastic time. To mark the occasion many photos were taken, one of which Pete displayed on the wall. That meant dad enjoyed many more visits (to see his photo) until sadly he passed away two years ago. If you go to the Blacksmith Arms you will still see him wearing his medals, wishing he was having a pint too. A group of CAMRA members visited the Norman crypt of St Mary’s church opposite for which Lastingham is famous – an eerie experience when one of them developed echoing hiccups! On the way home we called at the Jolly Farmers at Leavening. Here, in front of another blazing fire, we enjoyed York Guzzler, Taylor’s Landlord, Hop Studio Porter and Kirkby Lonsdale Tiffin Gold. Congratulations to the Blacksmiths Arms for making us leave the city walls. It’s a cliché, but it’s well worth seeking out this rather remote gem on the edge of the Yorkshire Moors. This entry was posted in OB115, POTS, Presentations, Pub News and tagged Blacksmiths Arms Lastingham on 26th February 2013 by York CAMRA. 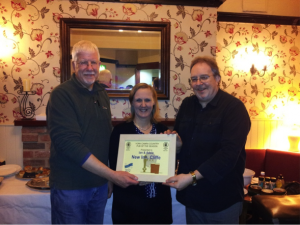 The Winter Town Pub of the Season award night at the York Tap turned out to be a truly memorable event for all who attended – and that was a very large gathering indeed. This was in no small part to the efforts of the York Tap who decided to make the event a celebration of Yorkshire ale – and in particular breweries local to York who had won awards at last year’s Knavesmire Beer Festival. There has never been a pub in York that has showcased 18 “LocAle” Yorkshire ales on tap all at one time and this proved to be a massive attraction as people flocked to this unique event. There was a considerable attendance from the general public and the word had spread far and wide as real ale enthusiasts from all over Yorkshire poured into York station, including staff from nine breweries, which supplemented a very good turnout from York CAMRA members. 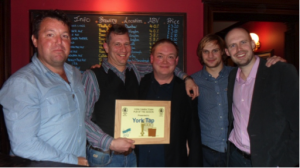 Presenting the award to the York Tap’s manager Jon Chappell, York CAMRA’s Nick Love outlined some of the reasons that the pub deserved the seasonal accolade. He invited those in attendance to look around them at the architecture of the building they were in. In particular the sensitive restoration of the 1907 former tearoom was praised for the attention to detail – the highlights being the terrazzo floor, the wonderful stained glass cupolas that let light flood in through the roof and the wonderfully striking island bar. All of this had recently already been recognised with the National Railway Heritage Award for Conservation. Obviously the beer is a hugely important criterion when selecting a CAMRA pub of the season and no-one needed it pointing out that night what a fabulous selection was available to all who attended that night. It was pointed out though that the York Tap kept its patrons happy throughout the year with an ever-changing eclectic selection of beers served in top condition. Finally there was the recognition that this National Cask Ale Pub of the Year had greatly contributed to the allure of York as a real ale city and had become a destination pub due to its convenient location and beer selection, with groups from as far as London making day trips to sample the vast ale selection and unique atmosphere. This entry was posted in OB115, POTS, Presentations, Pub News and tagged York Tap, Yorkpubs on 26th February 2013 by York CAMRA.